Happy Little Munchkins: Ice Treasures! For my Ice: Play Time Challenge, I decided to put little 'treasures' into a silicone muffin tray, cover with water and freeze. In the morning, they were my ice treasures! I had some shells, a rubber ball and some coins for Eden's money box inside, and it was her task to find a way to get the treasures out. I placed the ice inside a shallow tub with some spoons, a measuring cup and a container of warm water and just let her experiment with them. With Daddy's help, she quickly discovered how to melt the ice in the water to release the treasures inside! Eden loved, loved, LOVED tackling this challenge! She enjoyed playing with the ice and watching it melt slooooowly in her hands, and she liked how 'swipperwy' it was too. Most of all, I think she really enjoyed the stimulation of her senses and also of her problem-solving faculties. She, like most toddlers, enjoys the opportunity to discover something new (in this case, how to melt ice, seeing how it changes back to water, etc). How have you introduced ice to your child? I've been wanting to try some ice melting activities. I think I will try this with some of our new Toob Penguins when we do our penguin activities! Just wanted to let you know we tried this, and my boys loved it! My 5 year old is asking to do it again too! Haha! What is it about ice that kids love sooo much? I'm so glad your boys enjoyed it too! Thank you for sharing this at WOTT! I featured it this week, so feel free to use the featured button if you would like to. We played with ice last week too, I just haven't gotten around to posting our weekly recap yet. Thanks! It was a ton of fun! I blogged all about it and sent a shout out to you! Thank you for the inspiration! Thanks for the sweet comments on my blog! I am your newest follower on GFC too. Thanks again for sharing. Have a blessed day with your munchkins! Great ideas! Thanks for linking up at Thematic Thursday. This is a fabulous idea! My boys (2 and 4) will be all over this. They love ice and are very interested in it. THey will love trying to get their treasures out! I can't wait to try this with them. 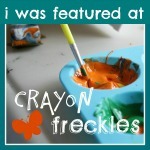 I am new to the Fun Stuff Fridays linky http://trailstentstirelesskids.blogspot.com/ and I am so happy to be connected to such a creative group of bloggers. Thank you! I never tire of watching kids play with ice, it's such a fascinating substance to them! Found you from Mingle with Us! This activity would go along nicely with all the winter themed activities I've done this month with my tot and preschooler! I'm your newest follower on GFC! How fun!! I definitely want to try this. Thank you for sharing it at Sharing Saturday! Thanks Carrie, hope your kids enjoy it! ~ L.